The following Unmanned Aircraft Systems (UAS) research and development roadmap was published in March by the U.S. Joint Planning and Development Office, a multiagency initiative that includes the Department of Transportation, Department of Defense, Department of Commerce, Department of Homeland Security, Federal Aviation Administration, National Aeronautics and Space Administration and White House Office of Science and Technology Policy. 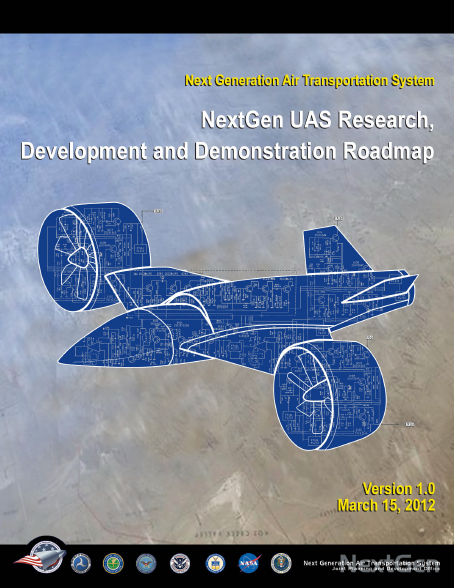 This is the first report of progress in producing a NextGen Unmanned Aircraft Systems Research, Development and Demonstration Roadmap (NextGen UAS RD&D Roadmap). The activity was established to enable a responsive, efficient, timely, coordinated multiagency Research and Development (R&D) effort that will enable the U.S. to realize fully the benefits of Unmanned Aircraft Systems (UAS) in the National Airspace System (NAS). The use of UAS dates from the earliest days of flight. UAS today play an increasing role in many public missions such as border surveillance, wildlife surveys, military training, weather monitoring, and local law enforcement. However, expansion of domestic UAS operations has been inhibited by lack of a common understanding of what is required to safely and routinely operate UAS in the NAS. Challenges such as the lack of an onboard pilot to see and avoid other aircraft and the wide variation in unmanned aircraft missions and capabilities must be addressed in order to fully integrate UAS operations in the NAS in the NextGen timeframe. The Office of Management and Budget recently tasked the NextGen partner agencies to develop a strategic, multiagency, NextGen UAS RD&D Roadmap with facilitation and assistance from the Joint Planning and Development Office (JPDO). The primary objective was to identify the most critical technology issues involved in establishing a plan for UAS operations. The results are contained in this document, which will serve as a baseline for further development of the Roadmap. In an effort to plan for the projected growth in UAS operations, the Office of Management and Budget (OMB) tasked the NextGen partner agencies to develop a strategic interagency UAS Research, Development, and Demonstration (RD&D) Roadmap, to be delivered to the by Joint Planning and Development Office (JPDO) September 30, 2011. The JPDO has an interagency focus, coordinating NextGen efforts among the FAA, the National Aeronautics and Space Administration (NASA), the Departments of Commerce (DOC), Defense, and Homeland Security, and the White House Office of Science and Technology Policy (OSTP). The legislation establishing the JPDO3 calls for the organization to guide NextGen research and development by coordinating goals, priorities, and research; facilitating technology transfer, and creating multiagency roadmaps. The same legislation calls for the JPDO to ensure that NextGen can handle a wide range of aircraft operations, such as UAS, to the same high level of safety in the NAS that the FAA demands today. In this context, the JPDO is facilitating and coordinating steps to make sure that all stakeholders have an understanding of the collective agency plans, and to develop clear strategies and requirements for UAS in a NextGen environment. The ultimate goal is to enable a responsive, efficient, timely, coordinated multiagency research and development (R&D) effort that will enable the U.S. to realize fully the benefits of UAS operations in the NAS. The NextGen Concept of Operations (ConOps)4 was developed by the JPDO to meet the goals and objectives established in the Integrated National Plan for NextGen5 established in response to the Century of Aviation Act. • Net-Centric Operations (NCO) – Network-Enabled Information Access provides secure information access. • Performance Based Operations and Services applies minimum performance levels through regulations and procedures to maximize capacity in congested airspace. • Weather Assimilated into Decision Making applies both probabilistic and observed weather information to ATM decision tools. • Layered Adaptive Security deploys a multilayered security system to deter threats, proportional to the assessed risk. • Position, Navigation, and Timing (PNT) Services – Broad Area Precision Navigation uses satellite navigation to accurately and precisely determine one’s current location and orientation. • Trajectory Based Operations (TBO) dynamically adjusts a flight path in space and time using a known position and intent to allow a decrease in separation and increase in NAS capacity. • Equivalent Visual Operations provides aircraft operators with the critical visual information needed to maintain safe distances from other aircraft, terrain, and airport infrastructure during night and instrument metrological conditions. • High-density Arrival and Departure Operations improves terminal aircraft movements. Key features of these concepts support the integration of UAS in the NextGen NAS. The transformation from clearance-based operations to TBO increases system capacity, flow management, and efficiency. Advancements in aircraft systems allow for reduced separation and facilitate transition from rules-based operations to performance-based operations.